In this Light Painting Video Tutorial Jason D. Page shows you how to create a Light Painting using the Light Painting Brushes system. Light Painting Tutorial using the Light Painting Brushes System. This is an in depth light painting tutorial video that will show you the basics of light painting photography and how to light paint. 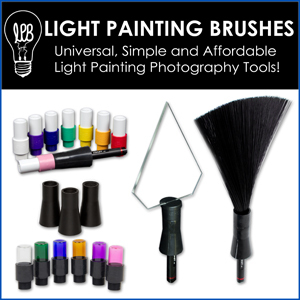 This tutorial also explains how the light painting brush system works, the equipment you need to get started light painting, and takes you step by step through creating a light painting using tools from the light painting brush system. Position your tripod and get your light source ready where it can be found easily. Frame the shot that you want to create, this is best to do with the lights on; if you are in a dark environment turn on your light source to project light onto the scene so you can frame the shot. Next you need to focus the image, if you are in an place where you can turn lights on and off TURN THE LIGHTS ON FOR THIS PART. Zoom in as far as you can to the part of the frame you want in focus, if the lights are on you can use your autofocus. Once you have the focus set, switch your lens over to manual focus and leave it there, now zoom back out and re-frame your shot. Using this technique will ensure you get a sharp image. Turn all lights off. 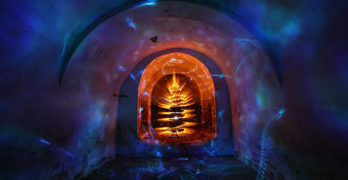 Open the shutter of the camera to begin your long exposure, illuminate your Light Painting Brushes and begin to paint.